Medical coding will become second nature with Mastering Medical Coding, 4th Edition! 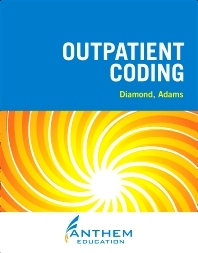 Created with students in mind, this text is approachable and packed with real-life practice exercises, and teaches students how to use physician documentation as the basis for complete, accurate coding. You’ll strengthen your coding skills with exercises from Godfrey Medical—a simulated medical practice— Stop and Practice exercises, and additional exercises found in the student workbook and Evolve companion website. Visual and tear-out “tools” provide real applications for coding. Teachers benefit with a text that emphasizes actual patient record and documentation and is fully updated to reflect new codes and coding guidelines. In addition to fully updated content, the new edition has new content on anatomy and physiology, expanded discussion of the use of the medical record in coding, streamlined coding tools, and improved examples. Become prepared for a career in medical coding with Mastering Medical Coding, 4th Edition. Emphasis on physician documentation prepares students to locate and determine the actual “diagnosis” and “procedure” from documentation. Coding reference tools, in an improved and streamlined form for the 4th edition, encompass important chapter content. Coding concepts are built upon basic ICD-9-CM and CPT concepts rather than a body system perspective for greater ease and productivity from students. Stop and Practice exercises, simulated medical practices, Chapter Review exercises with practical applications, and additional exercises in the student workbook means students constantly practice and reinforce their understanding of the information. 24. You Learned It, You Earned It: Get that Coding Job!